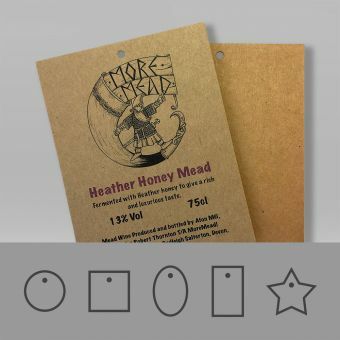 Step 1 - Choose the material your swing tags will be made from then select options like shape, size, design and finishing touches. We’re here to help guide you through creating your perfect swing tag. 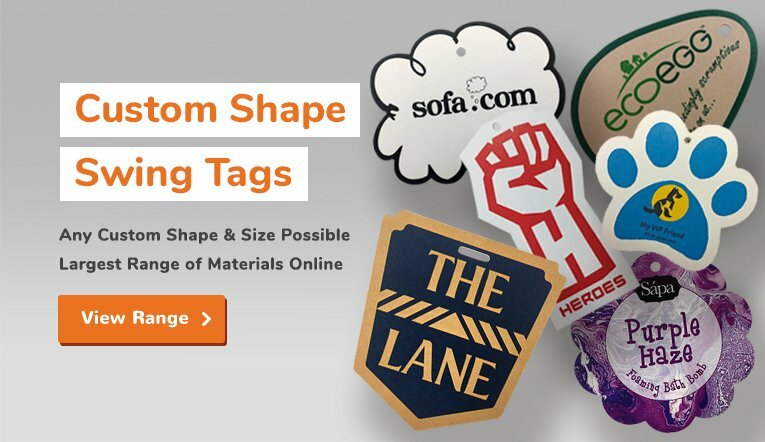 See how to setup your tag artwork and download our tag templates now! What is a Swing Tag? 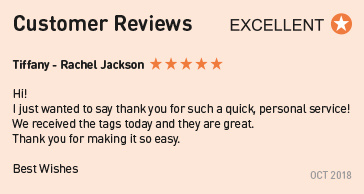 We have tried to make your order journey as smooth as possible. Please read through the step by step guide to see how our order process works. A nice, easy start to the order journey. 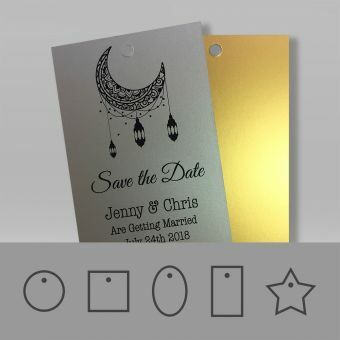 Simply choose your swing tags material, shape and size. 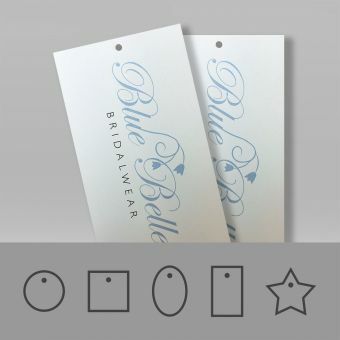 Once you’ve decided on your tags basic appearance, you’ll need to let us know, how many sides you require printing, single or double sided? Next up are the finishing options. You will be faced with four choices, Drill Hole, Cornering, Eyelets and String. 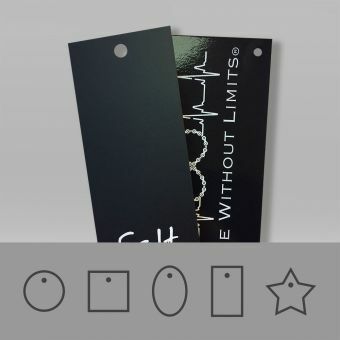 Please read all about the available finishing options, so you understand what will work best for your tag. 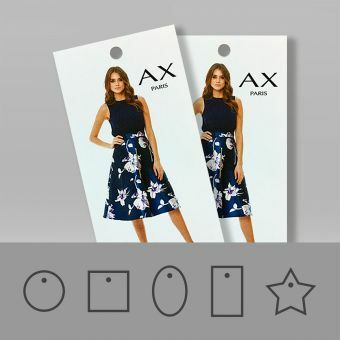 Once you’re happy with your selection, just choose the number of tags you would like to order. Ready for the fun part? It’s time to get creative with artwork. We have given you as many options as possible, to make things easier for you. Choose to download a preset template in various design applications to ensure you start your design off right. 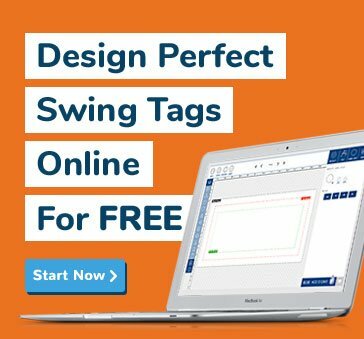 Alternatively, upload your artwork or try our superb online designer to create your swing tag masterpiece. When you've entirely built your order, you will need to go through our quick checkout process. Choose your delivery option and complete your payment. Once we receive payment, your order will move fast through our production process. 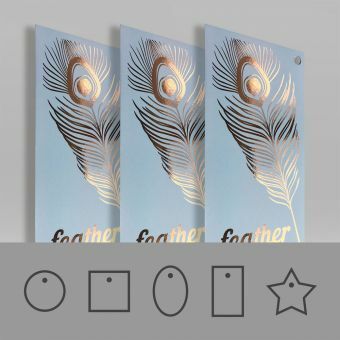 Our artwork team will email you a print ready PDF proof for approval and the material for your tag order will be allocated and prepared for printing. As soon as we schedule your delivery, you will receive an SMS text or email notification from our courier with a delivery date and a 1-hour delivery window. 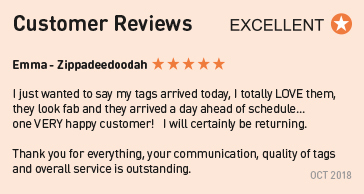 So there’s no need to wait in all day for your delivery, we know how frustrating that can be! 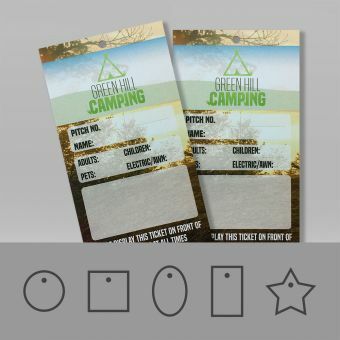 Sit back, relax and look out for your Handy Tag order to arrive 48 hours later. Yippee! Here's a snapshot of our delivery policy. A more in-depth delivery guide can be found here. 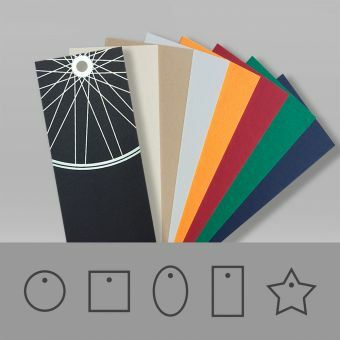 One thing is for certain; we aim to print finish and despatch your order as quickly as possible in the highest possible quality. We take great pride in every order we produce for our fantastic customers. We deliver throughout the UK, Northern Ireland, Southern Ireland, Scottish Highlands and Islands, plus Europe. If you require delivery to a non-European destination, this is possible be will need to be quoted for on a bespoke basis; this is not an online service. Delivery to any mainland UK destination is FREE, so no hidden extras at checkout. 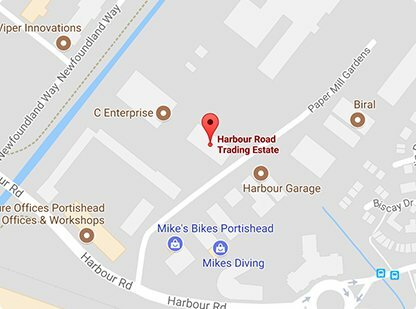 Delivery areas outside mainland UK will incur an additional charge at checkout which will be displayed before you proceed with your order. 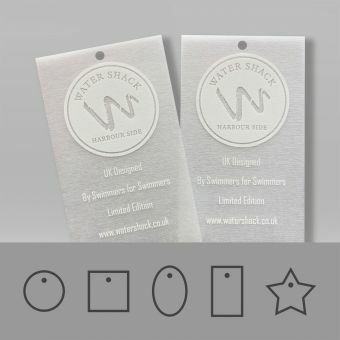 How fast can you print my swing tag order? 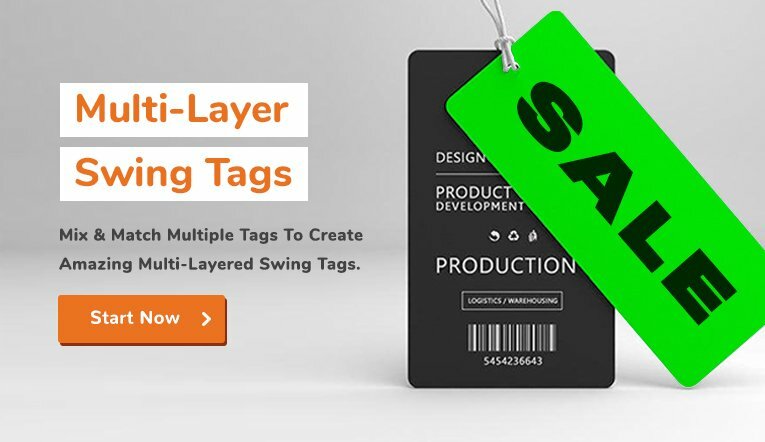 Once you have approved your PDF swing tag proof. 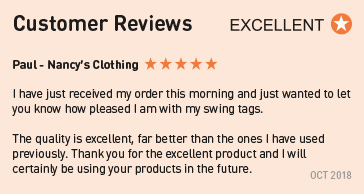 We aim to print, finish and despatch your swing tag order within 48 hours. We use a trackable next day delivery service via DPD for all mainland UK destinations. Deliveries to destinations outside of mainland UK will result in additional days in transit; please allow for this. What time of day do you deliver? Once we've booked your order in for despatch, you will receive an SMS text message or email with a delivery date and time, with 1-hour delivery window. In general, your order will be delivered between 9am - 6pm, Monday to Friday. (Not including Bank Holidays). Yes, we can arrange for your order to be delivered on a Saturday. A Saturday delivery service will incur an additional charge, this type of order cannot be placed online. 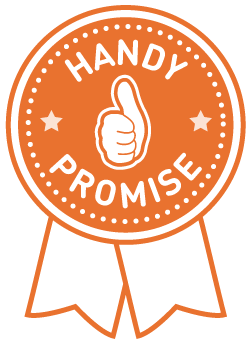 Please contact our handy customer service team on 01275 460517 for further help. Do you require a quotation for a product that’s not available online? 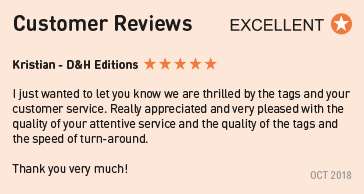 If so, please give our helpful customer service team a call on 01275 460517 or email [email protected], and we will help you every step of the way. What we need to know about YOU? What we need to know about your SWING TAG? 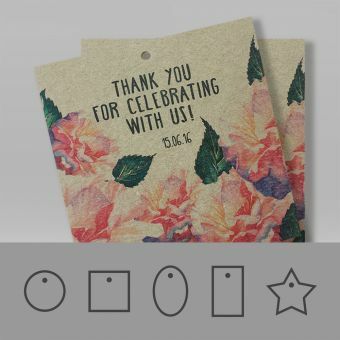 Printed sides: Single or double sided? 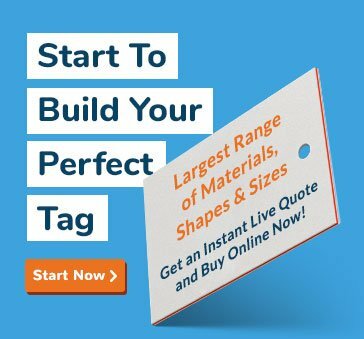 Does your tag need string, eyelets or custom cornering? Special requests: Please can the drill hole be large enough to take thick ribbon. Once we have your details, you should expect a reply within a couple of hours and no later than one working day (excluding weekends and bank holidays). 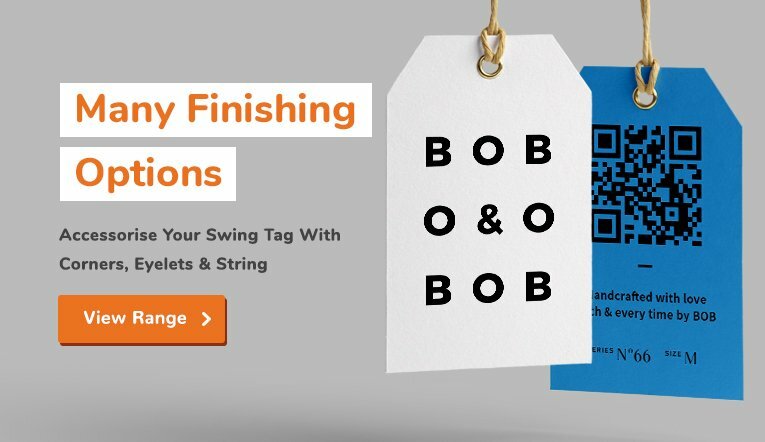 There is an infinite number of sizes, shapes, colours and materials along with many other options that go into making your perfect swing tag. If you have any doubts whatsoever about any part of the process, please call us, and we will help you through the process. 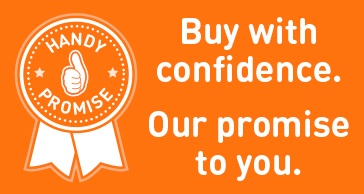 Alternatively, take advantage of our Free sample pack and try before you buy! 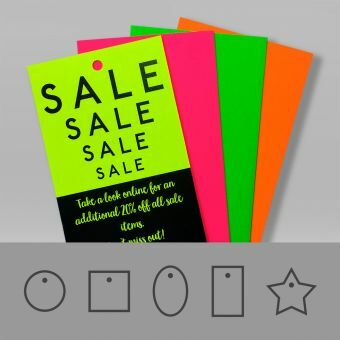 Over the years we have built up a large client base by providing quality retail tags for a variety of applications. We’ve dedicated our knowledge, progression and website to everything tag related. 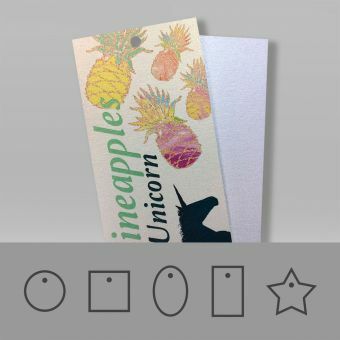 This is a niche we’re very comfortable offering, rather than spreading ourselves too thin with a huge list of products as the majority of commercial printers do. We place great importance on keeping costs to a minimum in order to provide the best value for money possible to all our clients. We're also dedicated to maintaining the high standards that have made us the first choice for many companies around the UK. 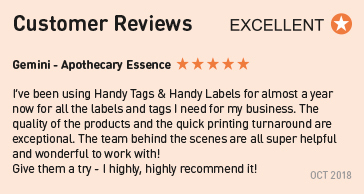 All tag printing is produced at our modern facility just outside Bristol, so we are able to keep a close eye on quality control. We maintain an unrivalled level of expertise and can pass on the benefits to our fantastic customers. After all, the more successful you are, the sooner we’ll have the pleasure of serving you again.